Stormwater from the Saint-Gobain facility is conveyed in underground piping and discharges to the Merrimack River at a stormwater outfall east of the facility, on the west bank of the Merrimack River. On Tuesday, September 25, Saint-Gobain’s environmental consultants conducted a dye test to evaluate how stormwater from the outfall mixes in with the river. During the test, a red dye (Rhodamine WT) was released from the stormwater outfall for approximately one hour. These observations will help identify locations in the river that should be sampled during future sampling events, to make sure samples are collected from the mixing zone. This dye has been approved by USEPA for use in similar applications. 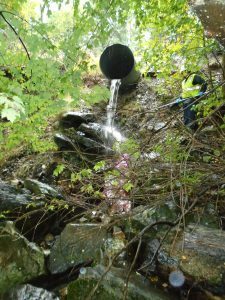 Studies of this type have previously been completed near wastewater treatment plants in other NH communities. Concord, NH – At the request of the New Hampshire Department of Environmental Services (NHDES), consultants for Saint-Gobain Performance Plastics (SGPP) will be conducting – weather permitting – a dye study on Tuesday, September 25, 2018. The purpose of this study is to evaluate the interactions between surface water and storm water where the Merrimack River flows close to the Saint-Gobain facility on Daniel Webster Highway. 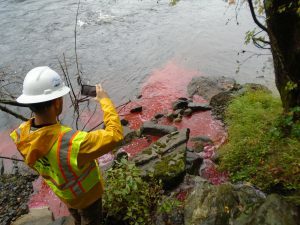 During the study, a red dye (Rhodamine WT) will be released from a storm water pipe on the west bank of the river for approximately one to two hours. This dye has been approved by the U.S. Environmental Protection Agency for use in similar applications. 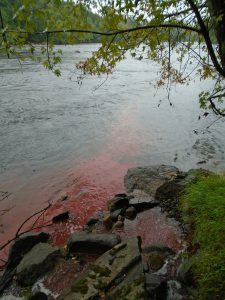 During this time portions of the Merrimack River may briefly have a red hue. Studies of this type have been conducted previously at the wastewater treatment facilities in Dover, Portsmouth, Exeter, Newmarket, Hampton, Seabrook, Newfields, and Kittery, Maine. For more information about this study, please contact Jim Martin, NHDES Public Information Officer at (603) 271-3710.